It isn’t just becoming an illusionist with a pickaxe. 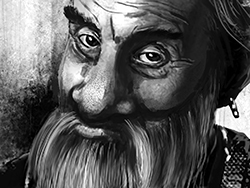 In AD&D, some of the gnomish abilities might surprise you and add a lot of flavor to your game. In a previous article about How To screw Up Races we took a look at some of the level limits and gnomes have some heavy ones. Thief remains unrestricted, but no surprise there – that is true of ALL races. These restrictions may be one of the key things that turn players away from gnomes. But they do have some benefits, some that get overlooked and unused. Gnomes start the game with at least 6 languages. What often gets over looked is their ability to communicate with any burrowing animal. I admit, I had forgotten about this until I re-read the section for this article! Gnomes are related to dwarves, but aren’t on the list for ability bonuses, another blow to their appeal on creation. Underground detection of walls, slopes, unsafe structure etc. It is often forgotten that gnomes aren’t strictly underground folk. They enjoy fully wooded areas and secluded hills away from humans. Through many writings, stories and examples, they enjoy long names with varying degrees of complexity. Playing a gnome adds some interesting dynamics to game sessions. It is usually best to multi-class with the thief class if your party intends to go for the long campaign. This way you will always be progressing with the rest of the party in some way. Being a gnome, like any race of AD&D is as open to interpretation as the player behind the sheet. A hardy gnomish warrior is a force to be reckoned with, even if they stop progressing at level 6. Add in some illusion, and things get interesting! Who are your favorite gnomes? ← You don’t have to be an experienced gamer to play an Elf! A long, long time ago (c.1982), I created a pair of gnome Fighter/Illusionists PCs that happened to be brothers. One of the biggest challenges I always faced when playing them was to make maximum use of their Illusionist capabilities. They spent most of their adventuring lives as second-line fighters, (damn good ones but still, never quite powerful enough to maintain positions at the front). They have mostly above-average stats but they’re not super-gnomes. They have an adventuring uncle that is an Illusionist/Thief but I only use him as an NPC. Also, I waived demi-human level limits years ago, so they are both higher level than their BTB racial limits allow. I was/am so fond of these guys, I write fan-fiction about their adventures. But as I said, I wish I had been more adept/inventive at using their Illusionist abilities and am always appreciative of creative input in that regard.